Vertigo is one of the most common symptoms a person can experience. Because there are so many vertigo diseases that are responsible for this symptom, doctors often struggle to pinpoint what is at the root of a patient’s symptom. As a result, about half of vertigo patients will never learn the underlying cause. Does that mean you are doomed to deal with vertigo for the rest of your life? What we are going to do today is discuss some home remedies that can help with vertigo. Then we will introduce you to a natural therapy that has helped hundreds of vertigo patients in case studies. Hopefully, this will help you to experience fewer or less severe bouts of vertigo so you can restore the quality of your life. If you suffer from chronic or recurring vertigo, here are a few things you can do at home to try and get some relief. Deep breathing – Many bouts of vertigo are due to anxiety or stress. If this is the case for you, you may be able to end an attack faster by taking some deep breaths. Be sure to relax your abdomen so that your diaphragm can drop properly and you can fill the lower part of your lungs. Some people have the idea that the chest should puff out when you breathe in but that your stomach should tuck in. If you do this, you are only filling the top part of your lungs with oxygen. Be sure to allow your abdomen to expand as well. Breathe slowly. You can count to three both while inhaling and exhaling. Get a massage – Especially, you want your neck and head to be massaged. This will help to improve blood flow and can reduce stress and anxiety. It relieves two of the underlying causes of vertigo at the same time. Drink some water – Vertigo is an early sign of dehydration. Drinking more water may help prevent another bout from occurring later. Look at the horizon – If your vertigo occurs in a car or on a boat, looking forward at the horizon can help your body to find a center visually. While many vertigo problems are related to the ear, some are related to our vision. In this case, seeing where you are going can help dispel false sensations of movement. Grab hold of something – First of all, this can stop you from falling. Second, it can give your brain more information to process, helping it to see that you are not actually moving if you are holding onto something stationary. Again, there are other places besides your ears that balance information comes from. The soles of the feet and palms of the hands can help. So have your feet planted firmly on the ground and find something to hold onto that can support your body weight. Do some head rotations – This isn’t just a neck exercise. It can also help the mechanisms inside your ears that help with balance to reset. It’s similar to the concept of rebooting your computer when things aren’t working right. Sometimes just setting everything back to zero and starting over is easier than correcting a problem while it is happening. 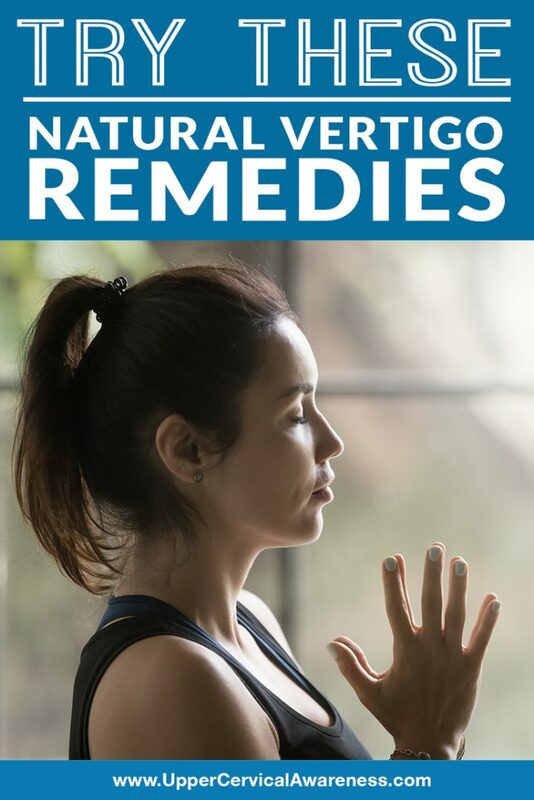 These are just a few natural ways to get natural relief from recurrent bouts of vertigo. But what if you are looking for natural care that can provide long-lasting benefits and perhaps even help you to break free from vertigo completely? We would like to introduce you to a subspecialty of chiropractic care called upper cervical chiropractic. Blood flow – When the top bones in the neck are out of alignment, it can affect the free flow of blood to the brain. This is because the cervical vertebrae have bone loops called vertebral foramen that provide safe passage for the cerebral arteries. Unfortunately, this also means that misalignments can affect the proper flow of blood, leading to problems for the central nervous system. Brainstem function – The atlas surrounds and protects the brainstem. But this also means that proper alignment is vital. Even fractions of a millimeter could lead to the atlas putting pressure on the brainstem and inhibiting proper function. Ear function – The atlas is located directly between the ears and can have a profound effect on balance when out of alignment. This is because the soft tissue around the atlas shifts to keep the head properly balanced, despite any misalignment. Unfortunately, those shifts can affect the eustachian tubes that carry excess fluid away from the ears. The results can be vertigo and other ear problems ranging from tinnitus (ringing in the ears) to partial hearing loss. A quick way to find out if you need your atlas and axis adjusted is to see an upper cervical chiropractor. We are specifically trained to precisely detect and gently correct this specific type of misalignment. To learn if this is the right way for you to get natural help for your vertigo, contact a practitioner in your area today.